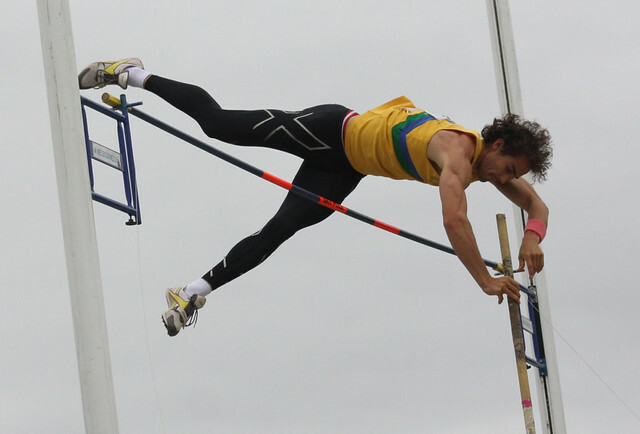 James Sullivan has been chatting to Australian decathlete Steve Cain who gives an in-depth insight into the life of an elite multi-eventer. Steve Cain is an elite athlete from Melbourne, Australia who specialises in the decathlon. He has won multiple Victorian State and Australian National championship titles at both junior and senior level. His PB of 7844 points, achieved at the 2012 Victorian Championships, ranks him 10th on the Australian all-time list. In 2011 he represented Australia at the World University Games at Shenzhen, China, finishing in 7th place. Steve: Camberwell/Malvern little athletics in u/9, through my primary school I would guess. Steve: Not really. If anyone it would have been the best hurdlers in the world when I was young: Colin Jackson & Allen Johnson. Steve: My first ever national championships were in Sydney 1999, as a year 9 student at St Kevins. I competed in the Triple Jump, 100m Hurdles, High jump and 200m Hurdles. While in the stands at this event, another athlete had a “multi event points book” and it was then that I realised there was an event that you could combine many individual events. I returned from this event and Simon Lewin, a friend through school, introduced me to my current coach Efim Shuravetsky. I started training with him and his team of coaches, learning all the events with a group of heptathletes. I also started pole vault with his son Julian, and did my first u/20 decathlon as a 16yr old. Whilst I was disqualified in that comp (for not attempting the PV… another story!) I was allowed entry to the national championships where I placed 2nd. It was then when I thought I could make something of Decathlon. Steve: Pole Vault would probably be my strongest event. Long jump would need the most improvement! James: Somewhat related to the previous question, what are your favourite and least favourite events? Steve: My most favourite are those events that go well on the day! And vice versa, if an event goes bad I don’t like it. Everything equal…. pole vault, javelin, hurdles are more favourites while it will be a life changing day when the 1500m becomes my favourite! Steve: Making the World Uni Games was a great moment, but I am most proud of winning my first national title in 2009. Not because of the performance on the day, or the score (which wasn’t amazing) but for the attitude and determination in the days/weeks/months and years leading up to that season. I had been injured for soooo long, and was still carrying injuries which would have made it easy to bypass that season all together, so I was proud to even get to the start line. Or, at 28yrs that I still believe 100%, despite injuries etc etc, that I will still improve! James: After starting 2012 on a high note with a PB in the Victorian State Championships you missed the rest of the year and a chance of qualifying for the London Olympics through injury. Can you put this disappointment into words? What positives have you taken from it? Steve: Of course you can put it into words…. Things Happen! Some things are good, some aren’t so good! You do all you can to prevent injury and treat them when they arise, but at the end of the day you have to take each day as it comes and if there are a succession of days where you can’t do anything, you can either work around it or accept it and move forward. An injury is never ideal, and I had to take some time off which I had no choice over. So you move up and move on, and reset goals to keep you going. Unfinished business! James: The Australian track season is in full flight now. What are your goals for 2013? Have you got the Moscow World Championships in your sights? Steve: I still have much training to get done, and to increase the quality/quantity of training. Looking to compete at the State and National championships in Australia before heading overseas for another 1-3 comps, hopefully one of those is in Moscow. James: Can you give an insight into the training of an elite decathlete? At this time of year, what would an average week of training look like? How does this change come the Australian championship season in February to April? How do you combine so many different disciplines into a training week? Steve: In short, it’s very difficult with many variables needing consideration (events, recovery, work, different: coaches, training partners, locations etc etc) At present, each event receives some attention twice every week with one training session focussing on the event itself, and another session to add supplementary exercises. We have 5-6 gym sessions each week, with 2 designated for power lifting and the other three include a combination of those supplementary exercises and additional gym work. We do 2-3 running sessions each week which are combined with a jumps event, either Long Jump or High Jump. Separate throws sessions are done for shot put and discus, while javelin is combined with Pole Vault. On top of this are recover/rehab/injury prevention sessions and a couple of 20-25min jogs. All in all, each week will usually have 12-15 training sessions, each varying between 90mins and 4hrs. The closer to competitions we get, the more intense our sessions and the less load we do, leaving a little more time for recovery. James: Many Australian athletes have struggled with the track season in Europe and the major championships being at a different time to the Australian track season and can often peak three or four months too early. Is this a concern for you, and how do you plan to manage this challenge? Steve: Any Australian athlete that takes pride in the Australian track season and puts value on our national championships will find an added difficulty with the differing times of season. Last year we attempted to peak for nationals in early April, then again for a 2 month season in Europe, whilst trying again to peak in August for the World University Games. Not only is it hard to arrange training to peak at various times, any athletics season that has you competing from January – August is too long! To manage this in the future, it would simply come down to a matter of priority, what is more important. If you are searching for qualifying performances for a major championship, you have to compete. If you have already qualified, train up and prepare for the big comp. James: No decathlete can get away without being asked this question. Many multi-eventers admit to not training specifically for the final event on the programme, the 1500m. Do you do any specific sessions for the metric mile? Why is this discipline usually overlooked in training by decathletes? Steve: Of course we do! It’s easy to say that training for this event is not as important as others, due to the running/aerobic benefits you receive from training for all other events. But there is value in running a good 1500m. Most of our general training will produce an ok 1500m but 9 events are power and the 1500m is more aerobic, so a little specific training is needed. Ideally we would do 20-25min jogs 2-3 times a week. Some may call that 1500m training, others may not. Other than that, we don’t do much long running, though 4x400m at race pace with 200m jog rest is a regular session we do, once every 2 weeks, as well as an occasional fartlek. James: How important is core strength work for a decathlete and how much emphasis do you put on it? What specific core strength exercises do you incorporate into your training? Steve: Directly post comp, I will try get a group of the Decathletes I’ve competed with and go for a jog of the track to TRY warm down, stretch and maybe even a couple of light run throughs. Then I would usually do a hot/cold session, maybe a massage, followed by a big meal to replenish energy stores. Then rest for a couple of days!! Ease back into training thereafter. Steve: This is true, and I think it stems from an appreciation of what it takes to prepare and complete a decathlon. Yes it is competitive against athletes, but it is just as competitive against yourself and the scoring system. All athletes have their own event aims, and work towards accumulating as many points during a competition as they can, and I think most athletes are encouraging of this and genuinely hope each athlete does their best. Many friends have been made through competition, and after competition. Steve: Yes. I think people always look at the end result and say they won the Olympics because they were faster/stronger/could jump further etc than everyone else, hence they are the best athlete in the world. It is often overlooked that the athlete’s ability to learn new skills, perfect current skills, adapt and maintain intense training loads, maintain mental focus for 2 days of competition is what makes them great, not just their performance! Steve: Shield/Interclub is a very valuable competition as it provides opportunity to compete as a team, against athletes of the same standard as yourself in a non threatening and non elite environment. I love to see people trying events that they have never done before to help their team whilst broadening their exposure and experience of the sport. Other than simply getting people down to compete and ensuring a fun and supportive club environment… don’t get me started on increasing appeal, long discussion! Steve: A can of worms for sure, but in short: I believe we get plenty of government funding, but where that funding goes is VERY questionable. I also think that athletics in Australia receive VERY little of the private/corporate sponsorship funding in Australian sport which is of equal concern. I work as an athletics coach, both privately and with a few school athletic programs as well as running a DJ business. Whilst having grown up in a supportive family of which I am very lucky, my income and no support from Athletics Australia makes it a very difficult juggling act! Steve: Hmmmm…. never been asked that before! Whilst perhaps not in the best interest of the sport as a whole, would it be too selfish to ensure all T&F events were given the same publicity and funding? It would also be great to withdraw the limit of athletes per country in each event at major championships for one year. Having 10+ Kenyans doing battle with each other over a 3000m Steeple Chase or all the American & Jamaican sprinters in with a chance to make a world stage final! Steve: As we are either training or competing most of the time, there are few aths meets we get to as a spectator, other than some in which my athletes are competing in. There is also very little TV coverage of athletics available in Australia, but Youtube is great for research and additional motivation! The magic and anticipation of a 100m race with Bolt is hard to beat, though watching Renaud Lavillenie attempt 6m+ in the Pole Vault is exciting! Merritt in the hurdles, but by far the best is watching ANY Aussie on the world stage, especially Sally of course! James: That’s great Steve. Thank you for your time and the very best of luck over the coming season and beyond into 2013. Keep up to date with Steve’s progress through his official website and facebook page. Check out a mini-documentary on Steve Cain here.